Natural Resources Minister Christian Paradis is defending his response to the tampering of access-to-information requests by one of his aides, saying it's unnecessary for him to resign because of it. 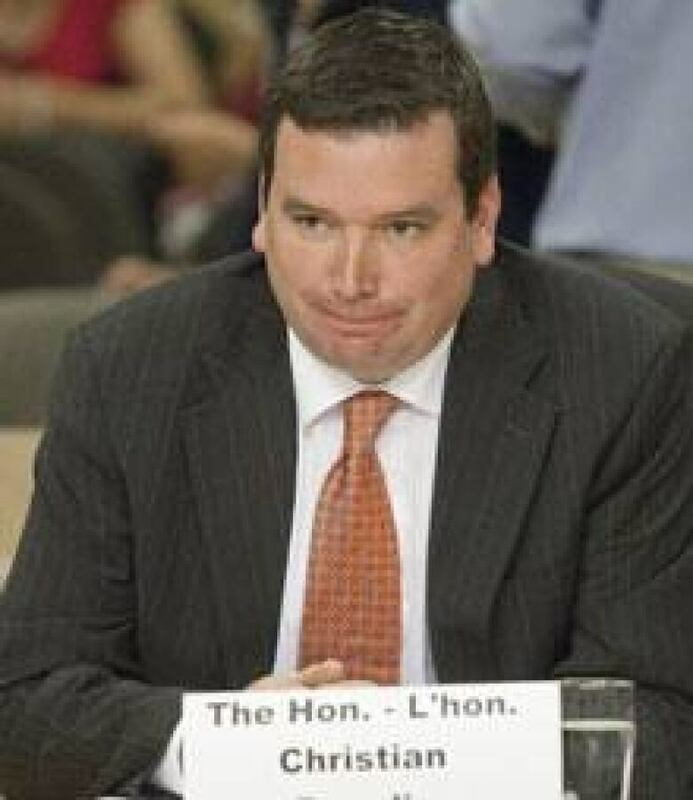 Natural Resources Minister Christian Paradis is defending his response to the tampering of access-to-information requests by one of his aides, saying he fulfilled his role as minister by transferring the file promptly to the information commissioner. "My role as minister was to make sure that the file would be transmitted promptly and proactively to the commissioner," he told reporters Monday outside the House of Commons, and repeated later on CBC's Power and Politics. "This is what I did as minister, this is what I had to do. I have nothing to hide and wanted to ensure that the proper institutions have the file." The minister's denials came just as The Canadian Press reported that two other members of Paradis' political staff were involved in gatekeeping the release of access to information documents. Two policy advisers — Jillian Andrews and Marc Toupin — appear in emails between aide Sebastien Togneri and bureaucrats that were recently delivered to a House of Commons committee, and obtained by The Canadian Press. All three staffers moved from Public Works to Natural Resources with Paradis last winter. The member of Parliament for Mégantic-l'Erable did not say if he had authorized Togneri to manipulate information requests and insisted he'd been told it "was a mistake committed in good faith." Togneri resigned last Thursday after it was discovered he directed bureaucrats to remove material that was destined for release in violation of federal laws. The minister's statement is unlikely to satisfy opposition members, some of who suggested during Monday's question period that Paradis should resign in a show of ministerial accountability. Liberals have asked Information Commissioner Suzanne Legault, whose office oversees the federal government's access-to-information practices, to investigate staff at Paradis's office, as well as at the Prime Minister's Office. "Overall in the government, the level of secrecy and the abuse of access to information by the Conservatives has never been higher," said Liberal MP Wayne Easter, who sits on the access to information, privacy and ethics committee. "We need to get to the bottom of this and find out how much. We believe they are greatly blocking access-to-information requests," Easter told CBC News on Monday. During question period, government House Leader John Baird defended repeated suggestions that Paradis resign, saying that by accepting Togneri's resignation "[Paradis] has demonstrated that he does accept responsibility in this regard." The NDP, too, is calling for an investigation. "If it's about ministerial accountability, it's the minister's head that should have rolled," NDP government affairs critic Pat Martin told CBC News. "No one really believes that a junior assistant in the minister's office acted alone and unilaterally when he was a repeat, serial offender. "We're hopeful that with the united interest of the opposition parties, we can take this issue beyond one hapless aide losing his job to evidence of serious, systematic undermining of the public's freedom of information." Togneri testified to the Commons committee in May that he had blocked the release of a document to The Canadian Press in July 2009, calling his actions "stupid" and a "mistake." A subsequent review found Togneri had interfered in at least three other requests, including those involving the backgrounds of a government panel examining asbestos and question-period notes prepared for Paradis. In July 2009, Togneri asked bureaucrats to remove records from an access to information request about preparations for U.S. President Barack Obama's first official visit to Canada. Togneri argued the department was providing too much information and that it was part of daily operations to prepare for such visits — contradicting a senior civil servant's opinion. Andrews was copied on a series of emails. "For more in depth analysis, please speak to Jillian," Togneri wrote, referring to Andrews. In another exchange of emails, bureaucrats wanted to know more from Togneri about material he had highlighted for exclusion from an access to information request. Togneri directs them to "please contact Marc Toupin on that file." The emails do not indicate what happened after Togneri referred bureaucrats to his colleagues. Andrews and Toupin did not respond to an emailed request for comment. Paradis did not respond directly to questions about the involvement of other staff.